This Quick Start automatically deploys a self-service cloud analytics environment on the AWS Cloud, using software from Informatica and Tableau, integrated with AWS services. Informatica Intelligent Cloud Services, for secure data pipelines to cloud and on-premises data. Informatica Enterprise Data Catalog (EDC), for data source cataloging that provides provenance, lineage, and relationships for data assets. A plug-in enables users to access business and technical context from within Tableau. Tableau Server, for secure, governed visual analytics. Amazon Redshift, for fast, cost-effective data warehousing. Amazon Relational Database Service (Amazon RDS) with Oracle Database, for storing aggregate data for the Tableau dashboards. The Quick Start uses AWS CloudFormation templates to deploy the solution either into a new virtual private cloud (VPC) in your AWS account, or into your existing AWS environment. A virtual private cloud (VPC) that spans two Availability Zones for high availability, configured with public and private subnets. 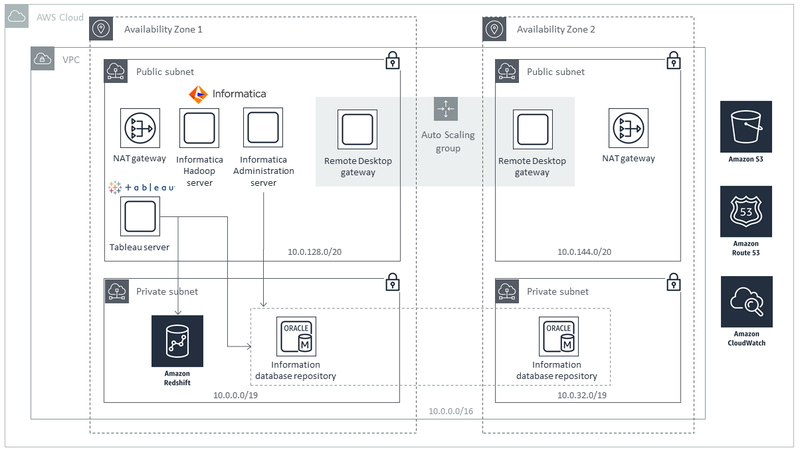 In the public subnets, a Remote Desktop Gateway instance in an Auto Scaling group, to provide remote administration and secure access to Microsoft Windows instances. In the public subnets, NAT gateways to provide outbound internet connectivity for instances in the private subnets. AWS Identity and Access Management (IAM) roles to enable AWS resources created through the Quick Start to access other AWS resources when required. The Quick Start gives you the option to build a new VPC infrastructure with these components or use your existing VPC infrastructure. Amazon Redshift as the data warehouse, to provide full fact tables, ad-hoc exploration and aggregation, and filtered drill-downs. Amazon Simple Storage Service (Amazon S3) to store the datasets, dashboards, and SQL queries for the Quick Start. A sample dataset that demonstrates the cloud analytics workflow. Amazon RDS with Oracle Database, which provides the Quick Start with high-query-volume aggregate tables that feed scale-out dashboards. Amazon RDS is deployed in multiple Availability Zones for high availability. A single-node deployment of Tableau Server with the ability to host and serve analytics dashboards and workbooks, and a sample Tableau Server dashboard that demonstrates how to connect to multiple data sources in AWS to optimize performance. Informatica EDC services, including the Informatica domain and the Model Repository Service, for data source cataloging. Informatica Intellligent Cloud Services, for secure data pipelines to cloud and on-premises data. Informatica Cloud Secure Agent, to run tasks and enable secure communications across the firewall between your organization and Informatica Intelligent Cloud Services. Register at Informatica Marketplace. You can request a free trial license for your project. Monitor the deployment, and get more information about the resources that were created. Test the deployment by accessing the EDC catalog, Tableau Server, and Informatica Intelligent Cloud Services. The Quick Start includes parameters that you can customize. For example, you can change the VPC configuration and customize settings for Amazon RDS, Informatica software, and Tableau Server. The AWS CloudFormation templates for this Quick Start include configuration parameters that you can customize. Some of these settings will affect the cost of deployment. See the pricing pages for each AWS service you will be using for cost estimates. This Quick Start requires a license or trial subscription to deploy Informatica Intelligent Cloud Services, Informatica Enterprise Data Catalog, and Tableau Server. You must register at Informatica Marketplace to obtain a trial license for Informatica Intelligent Cloud Services and to create a trial organization. Deploying the Quick Start will automatically activate Enterprise Data Catalog and Tableau Server software and trial license keys.